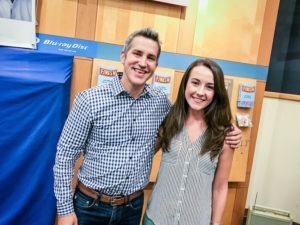 Jon Acuff is one of my favorite motivational authors and speakers. He presents ideas to help people and businesses start, finish, and CRUSH their goals. I decided to accept his most recent September-January Challenge. The idea is that with the shift in seasons, vacations ending and students going back to school, September presents a new beginning of sorts, similar to January. The point of the September-January Challenge is to pick a goal and work on it for 30 days straight. The more you do something intentionally over time, the better chance you have of it actually improving. One of my goals is to practice yoga each day this month to get in better shape. I also want to dedicate time to better assist my clients and help their businesses thrive. By committing a little, extra time each day to work on my goals, my efforts will add up and consistently improve over the next 30 days. Designating 20 minutes a day towards my goals is not a huge commitment, but over the course of 30 days that time adds up to 10 hours! What could 20 minutes a day do for the guest experience, team morale or even revenue? I challenge you to come up with something you would like to improve over the next 30 days. I’d love to hear what you and your team are working on and be able to cheer you on along the way! Next articleThe Seasons are Changing!